Weighty Matters: Has Your Doctor Ever Taken a Lifestyle History? Whether you're worried about your weight or not, how you live your life - how you eat and how you play - will markedly impact on your health and well being. In fact it'll impact on your health far more than any drug your physician could ever prescribe. 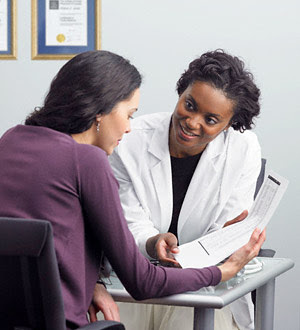 So why is it that most people have never had their physicians discuss healthy living with them? Sure, a doc may ask you whether or not you exercise, and might even inquire into your sleep, but do they delve further? My belief, though unproven, isn't that doctors aren't interested, and it's not that they're unaware of the benefits of healthy living, but rather that they're simply not taught to consider lifestyle in their clinical history taking, nor how to champion healthy living effectively. So what are the top 10 things I would want physicians to explore with you at a bare minimum? How many meals do you eat out (including cafeterias), order in or take out (including prepared supermarket counter foods) per week? Do you feel comfortable cooking? How many meals a week do you cook yourself by means of the actual transformation of raw ingredients? How many glasses of milk, juice, sugared soda and/or alcohol do you drink a day? What do you put in your coffee or tea, and how many do you drink a day? What's your typical pattern of daily eating (ie do you miss meals or snacks and what do you typically have for breakfast/snacks/etc.?)? (If married and/or with children) How many meals a week do you eat together as a family? What was your favourite sport or activity as a kid and why aren't you doing it today? How many minutes of simple walking might you be able to add to your day without it being a hardship, and when would it be (ensuring goal here is Specific, Measurable, Attainable, Realistic and Timely)? (If a parent of still at home children) Are you living the life, food, fitness and health wise, that you want your child to be living, and if not, what do you think you might improve? While I realize this list is by no means exhaustive (for instance it doesn't touch on other hugely important issues like relationships, friendships, sleep, job satisfaction, parental struggles, sandwich generation issues, socio-economic stressors, etc.) and may only scratch the surface of healthy living, it would certainly help a physician to get a sense of how their patients are managing their two most important determinants of health, and provide a myriad of opportunities to try to help collaboratively trouble shoot common barriers to healthy lifestyles. Unfortunately, while we physicians are all taught to examine the micro level minutia of each and every physical system in our annual review of systems, I strongly and firmly believe that as far as health benefits go, it'd be far more valuable to our patients to review the macro level of how they're are actually living their lives. Of course asking those questions up above will also necessitate having answers...and sadly, therein lies the problem. Medical schools and residency programs may do wonderful jobs at preparing us on how to treat illness with pharmacotherapy, but sadly the vast majority do a respectively terrible job at preparing us how to help patients manage, as Yale's David Katz puts it, "medical destiny's master levers" - forks and feet. Here's hoping that one day, the day will come where forks and feet get the medical respect they so clearly and desperately deserve.